At past Fiddle Hells, we've played common tunes together at various sessions, from a list of 52 tunes we assembled a number of years ago. Knowing some of these tunes can be very helpful in jam sessions, since it gives you some common ground with other fiddlers, across a variety of styles. A 2-CD set is available for these: skip down to the Original Common Tunes. We've put together a new common tune list for 2016 and 2017, again across multiple styles, based directly on your suggestions over the last 4 years of the Fiddle Hell online survey. There were more than 600 great suggestions on the survey (thank you all! ), and narrowing them down to just 52 has been a challenging and interesting process. We think you'll really enjoy the tunes on the new list! Just as on the original list, you probably play some of them already, and you may see a few that you personally suggested. Some of these tunes will be featured at Fiddle Hell 2017 at workshops, jams, and flash mobs. 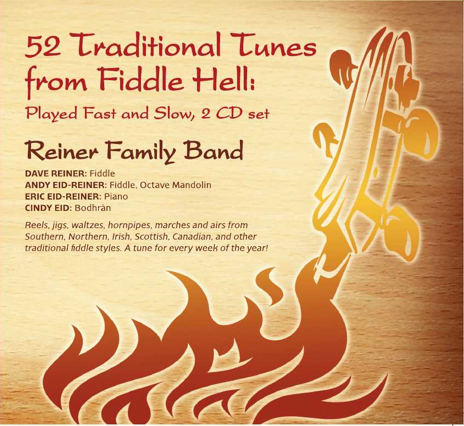 The Reiner Family Band is has recorded the new common tunes (played both fast and slow) on a new 2-CD set, available now in our Store! If your favorite tune didn't make it onto this list, you can still play it at Fiddle Hell. And of course, you can keep playing the original 52 tunes! Jolie Blonde - Cajun waltz in A, 3/4, P. D.
You can order a 2-CD set of the original 52 common tunes, played both up-to-tempo and slowly by the Reiner Family Band. This is just $15 postpaid (within the US) in our Store. This will help you prepare for Fiddle Hell, or learn the tunes even if you can't make it this year. Why 52 tunes? One for every week of the year, of course.